capacity places it between the outstanding Impact and powerful Max Dry Dual XT units. square feet. This model is so new that there are almost no consumer reviews to help you decide whether this is the right unit for your home. 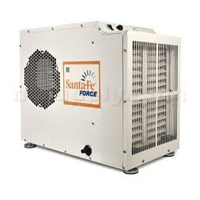 Santa Fe Force dehumidifier will be effective and that purchasers will be pleased with their choice. I do however have some reservations about this new model and believe that other units in the Therma-Stor range may offer greater benefits. The Santa Fe Force dehumidifier is good but other models may be even better for most users. I shall return to this subject and explain my reasoning in my recommendations at the end of this review. Meanwhile let's have a look at the features and specifications of this new arrival. The Santa Fe Force dehumidifier is purpose designed for use in the restricted area of your crawl space and with a height of only 21 inches will fit easily, even with the levelling feet in place and with a raised base beneath it. This model is capable of operating in ambient temperatures as low as 56°F so is suitable for cooler areas. It is also configured for ducted operation which is particularly important in a large crawl space in which air movement may be limited. The capabilities of the Force make it equally suitable for a large basement. At present there is no information about the noise generated by this appliance but, given its power, it will not be particularly quiet. Ducted operation would make this unit even more effective in a basement and this also provides an opportunity to enclose the unit which will reduce any noise nuisance you may experience. it for its technical capabilities. are more economical models in the Therma-Stor range which may be more suitable for many operators. The first of two alternatives is the Santa Fe Impact. The Impact has a moisture extraction rate of 105 pints daily and is suitable for areas of up to 2500 square feet. It is around $225 more expensive to buy than the Force but is over 50% more energy efficient. If the area you need to keep dry does not exceed 2500 square feet it is, in my opinion, no contest. The Impact will save you more money than the extra $225 spent to buy it. The second is the Max Dry Dual XT. The issue here in not quite so clear cut. The Max Dry costs around $400 more to buy than the Force and is just over 30% more energy efficient. It is rated for areas of up to 3600 square feet. You will have to rely on your own judgement here and on the advice of your supplier but, in general terms, the closer the area of your basement or crawl space approaches the maximum 2900 square feet capability of the Santa Fe Force dehumidifier the more likely it is that the Max Dry will save you money in the long term. It's your call. sure as I can be that you will be happy with it. Our visitors and I would be pleased to learn about your experiences if you would care to write a review for me to publish here.